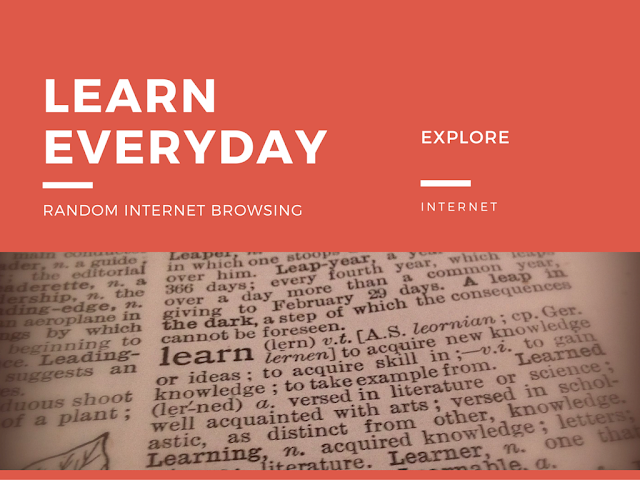 Wouldn’t it be great if you could learn something new everyday. Surprisingly there is plenty of information available on internet however its difficult to pick. I recently came across a feature of wikipedia that inspired me. The wikipedia supports a random page browsing option. You can also browse a random page on specific category. I looked over many other website and found many other leading wiki website support the random feature. This inspired me to also add a random page feature on my website. Just click on the SurpriseMe link on top menubar. In this article, I have compiled a list of some really awesome sites that support random exploring. I have also come up with a simple random browsing tool for you to explore all these awesome sites. You can Learn Something Absolutely new and unrelated everyday. Best way to spend time on internet. Confuse google and others with a mixed search history. You may already know that google and many others are tracking our search and browsing history. First thing first. This the time save tool for you to start random browsing without worrying about which site supports it. You can access the random browsing tool created by me on the below url. This tool randomly takes you to a random page on any of the below mentioned sites. Just keep hitting SurpriseMe button and it will keep showing some useful information on these good site. Yeah, I have hand picked these wiki sites (+ fromdev) for this random browsing tool. Feel free to suggest more useful sites to add in this tool. Why This Tool? - There are plenty of random browsing tools available, however they all send you to almost all junk sites. This tool is aimed to keep limited useful sites. Feel free to fork it and create your own niche on github. Here is a list of some useful websites that support random browsing. This should take you to a random page on wikipedia website. This should take you to a random page on wikipedia website in computer programming category. To browse any other category simply change the category name in url. Here is the list of all wikipedia categories. This should take you to a random page on How Stuff Works website. This should take you to a random page on Wiki How website. This should take you to a random TED talk on TED website. This should take you to a random page on wiki travel website. This should take you to a random page on wiki books website. This should take you to a random word on Wiktionary website. This should take you to a random page on Uncyclopedia website. This should take you to a random lyrics page on Wikia website. This should take you to a random lyrics page on Wiki Cars website. This should take you to a random lyrics page on game programming wiki website. At last, we too support random browsing. This link should take you to a random page on this website. Explore and see what you find out. You can also find the SurpriseMe link on top menubar for easy access.